The time has come to decide who you will vote for in the 2008 U.S. election. Before I start it should be perfectly clear for everyone that reads this that I am not an American citizen and thus have no right to vote in the election. But, I do have the right to voice my opinion about the candidates and their political stances. So, who should you vote for? Which one of the candidates is best fit to lead, Barack Obama or John McCain? For me, and the rest of the world, the choice is pretty obvious. Barack Obama should, and needs to be the next President of the United States of America. When it comes to environmental, energy and climate issues, only Obama stands out as the strong and aggressive candidate with a detailed and comprehensive plan to tackle these problems. While both candidates support a cap-and-trade system in the U.S. only Obama would enforce it properly. Obama wants to reduce emissions by 80% by 2050 compared to McCain's 60%. Obama also intends to auction off all emission credits, making the polluters pay for the right to pollute. McCain says he instead would give away many of the credit and not make the polluters pay until further "down the line". 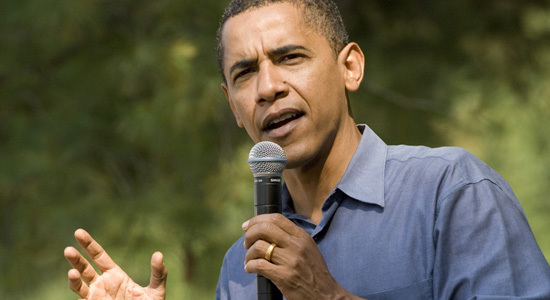 Obama would require 10% of the electricity in USA to come from renewable energy sources by 2012, and 25% by 2025. McCain says he supports renewable energy but hasn't offered any specific targets or plans. McCain has also been absent when the Senate has been voting to support renewable energy tax credits - four times. McCain supports the not cost-effective, dangerous and expensive nuclear energy, something that will worsen climate change. Obama realises the downsides of nuclear energy and has said that it's "not a great option", mainly because of safety and storage problems and because it requires huge government subsidies. While both candidates' supports the "clean coal" lie only Obama calls for a ban on new coal plants that donâ€™t have any carbon capture or sequestration. McCain is a strong supporter of offshore drilling â€“ something that only will supply 0.6% of the total energy consumption in USA and won't lower energy or gas prices. Obama has said he will "consider" offshore drilling as a part of a much larger energy plan. Obama wants to increase fuel economy standards by 4% each year. McCain says he supports higher fuel economy standards. But he hasnâ€™t offered any specific targets. When you consider the two candidates running mates the choice becomes even easier. The Democratic Vice President candidate Joe Biden has an impressive environmental record. Sarah Palin, the Republican Vice President candidate, on the other hand has an awful environmental record. She is a climate change denier, hates polar bears, and wants to drill in ANWR just to name a few things. John McCain stands for the same failed and devastating ideas and policies that have been in effect during the last 8 years. We don't need more of the same, we need change. hey. well I deff agree that Obama should be president and I cant wait to vote. Great post - I was wondering what stance blogs took on endorsing a candidate, and this was a really convincing explanation that's based on your subject matter. I published a piece last week about environmental groups being nervous about the next 4 years even if Obama wins, and people were up in arms because they're so excited about him. My commenters all threw his energy plans back in my face It seems like he's really got his head on straight and will take a proactive stance on the issue. Even if he's doing it to lower gas prices or decrease our dependence on the Middle East, it'll be a huge benefit to the environment as well. Obama's certainly planning to do too less, but in fact it's better than nothing. If I had to suggest somebody I'd go for Al Gore or maybe Derrick Jensen who would certainly be a strange person to be president, but those are the few people I'd know to do the right thing in every possible way.